When I tell folks that I am conducting my graduate research in the Solomon Islands, the most common response is “Where on earth are they?” It’s because of this reaction that I am honored to have the opportunity to share with readers some my experiences living in this relatively unknown, but culturally and environmentally rich island nation.The Solomons comprise a scattered double chain of islands that extends in a southeasterly direction from Papua New Guinea. The third largest archipelago in the South Pacific, the Solomons consist of over 900 islands, and encompass over 1.35 million square kilometers of sea. 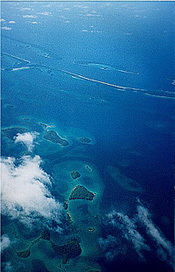 The islands are covered with dense rain forest and are surrounded by narrow fringes of coral reefs, lagoons, and mangrove swamps, which are among the most biologically diverse in the world.Common to many ecologically rich and economically poor tropical countries, the Solomon Islands are experiencing a number of critical environmental problems. Rapid population growth, recent civil tension, and the nation’s dismal economic status are identified as the driving forces behind a degradation of the environment, from both human use and conservationist perspectives.The population of the Solomon Islands is growing faster than any other Pacific Island nation and is expected to double over the next roughly 20 years, undoubtedly placing increased stress on the ability of the rural areas to support a subsistence lifestyle, while maintaining ecological integrity. Along with a high population growth, the country has other development issues, including high illiteracy rate, health issues, and more. In addition, since 1999, civil society in the Solomon Islands has been interrupted by the outbreak of ethnic tensions, particularly in the Guadalcanal Province and the capital city Honiara, fueled by an unstable government, a weak economy, and the influence of a number of armed “warlords.” As a result, there has been a collapse of transport and communication. Many of the major European-backed companies and expatriates (who held higher-level jobs), as well as Peace Corps volunteers, have left the country. In addition, many native Solomon Islanders have fled the capital city and returned to their home provinces, where work to support a family can be scarce. The Solomon Islands government has a history of promoting large-scale natural resource extraction (timber, fisheries, and most recently the development of gold reserves), and has recently engaged in a number of short-sighted and environmentally harmful activities, including massive commercial logging, the lifting of the ban on the live reef fish trade, and offering access to the country’s tuna grounds to foreign fishing fleets at extremely low rates. But despite these negatives, the region of the Solomon Islands remains a remote and magical place to visit. The combination of the islands’ relative inaccessibility (i.e., inconvenient air transportation routes), expensive airfares, and lack of tourism infrastructure, results in a small tourism industry. The bit of tourism that does exist consists largely of small groups of avid scuba divers, birders, or adventurer honeymooners, primarily from New Zealand and Australia. This means the islands have not yet experienced the ills associated with massive tourism development, as so many other Pacific island nations have, and for that reason they are a lovely place to visit. There are no major hotels, no swim-up pool bars, no umbrellas in fruity drinks. Instead, ecotourists stay in scattered thatched lodges on several remote islands where “Sol Brew” (the national beer) is the choice drink and the locals lifestyle is omnipresent. However, even this small tourism industry has a large effect on the local and national economies; the economic strain created by U.S. and Australian advisories against travel to the Solomon Islands–implemented due to political and social unrest–can be felt. The national airline, Solomon Airlines, depends entirely on Quantas and Pacific Airlines planes for international service, and thus can only use the planes when the other airlines allow. The country is now having difficulty paying for those planes, as well as keeping intra-island Solomon Airlines service afloat (the intra-island fleet is down to one or two planes from six). Many lodges have closed or are in extreme disrepair: in my first year, the Agnes Lodge had two huge leaks in the thatch roof over the outside patio; one had to complete an “obstacle course” to stay dry when it rained–and it rains a lot. I’ve traveled to the Solomon Islands twice over the past two years to conduct research for a graduate degree–I hope to go back again. Although I am nervous each time I land in the Solomons, thinking about the “what ifs,” I have yet to encounter any serious problems. That’s not to say the Solomon Islands are an easy place to be a tourist (they are not, and many of the Westerners who travel there do so for very specific reasons), but the civil tension that exists between islands groups is not generally targeted toward foreign travelers. Solomoners are actually quite fond of Americans–feelings that stem from the U.S. presence in the area during World War II when, according to Solomoners, GI’s were like kings and for the first time they saw whites and blacks work and pray together. These are experiences far removed from what they encountered during the Japanese occupation and from the longtime British colonizers. Before arriving in the Solomon Islands, one must understand the islanders’ idea of schedules: the country operates on “Solomon time.” Although time and schedules work differently in many developing countries, Solomon time is somehow unique. Perhaps this is because–unlike in other parts of the world, where a single delay can cause an entire outing to run amuck–in the Solomons, everything tends to work itself out, only several hours later than originally planned. Solomon time affects every dimension of life, from the national operation of airports and ministry offices, to going fishing with villagers. In many of the villages, there are few watches and calendars, and no phones, TVs, or clock radios. Village activities are dictated by the tides, the weather, the sun, and personal motivation. For example, I noticed that our village bell ringer occasionally rang the morning wake-up bell one or two hours late. The Sunday morning church service can start any time between noon and two. The five-seat airplane from Munda to Honiara can be on time, three hours late, or not come at all, with no explanation and few passengers expressing concern (except for nonislanders, of course). Instead, everyone just nods in agreement and says “It’s Solomon time.” The chewing of betel nut and tok tok are also a way of life and help contribute to this phenomenon. As a tourist, you must plan plenty of leeway when traveling. Most of my time was spent in the Western Province, an area that supports the country’s two most impressive barrier reef-lagoon systems, including the largest lagoon in world–the proposed UNESCO World Heritage Site, Marovo Lagoon. This area claims some of the best diving (often in World War II-era wrecks) and birding, as well as some of the best infrastructure to support tourism in the Solomons. Unless you are with a group and have chartered the dive boat, the Belikiki, in Honiara, or you travel by yacht, your choice of transportation in the country will be by ferry or plane. There are trade-offs: the plane, no doubt, is quicker (about 40 minutes to Seghe, to stop at the Marovo Lagoon; 1 hour to Munda to check out the Roviana Lagoon; and 1-1/2 hours to Gizo), but you are flying, and that alone can be cause for some concern. On my latest arrival to the Solomons, I was nervous about the stories regarding the lack of spare parts for planes so I decided to act more like a local and opted for the ferry, which costs about one-third the price and is safer, if not more convenient. The ferry to Munda was long–it left three hours late from Honiara for no apparent reason and took about 22 hours on the water. Fortunately for me, the ocean was not too rough and I had a cabin. The cabin was Solomon-style, meaning it had no windows or curtains, so anyone could poke their head in, and there was no lock on the door, it was littered with cockroaches, and did not have a toilet. However, the greatest shock came upon arriving at Munda and realizing the disembarkment area was right in the middle of the open lagoon–there was no dock! I learned a lesson, that I’ll pass on to you: if you opt for the ferry and you want to get off at Munda, make sure you’ve either arranged for someone to pick you up in their boat, or ask for a ride from someone on the ferry ahead of time. While it wasn’t a tremendous setback (I did make it ashore), I have flown every time since. Although Munda is the third largest city and supports a number of public services (such as, a bank, airport, hospital, etc. ), don’t expect a buzzing metropolis. 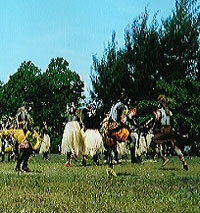 I’m told that in the days before the civil unrest, Munda was a happening, well-kept place. This is no longer the case. While Honiara and Gizo are more like frontier towns (one dusty street lined with a few stores), Munda can be equated to a large village. The town itself is dusty, a bit sleepy, with lots of people ambling about or just sitting and chewing betel nut. There isn’t a lot to do aside from stocking up on market items that can’t be bought in the villages, and you can walk the perimeter of the town in about five minutes. Situated on the lagoon at the end of town, however, is the Agnes Lodge–the center of Munda activity and a haven for tourists. This is great spot to take a break from the heat and organize your belongings before or after a flight. The food is quite good and there’s a nice patio (when it’s not raining) for drinks and relaxing. Every other Friday, the lodge hosts “barbeque night” (mainly for tourists), which is followed by “dance night” (where everyone is welcome); this will allow you to experience the only form of night life within a 200 mile radius–drunken Solomon Islanders, dancing to “Who Let the Dogs Out?” and, if you’re lucky, a brawl. I’d also recommend going to the lodge on the island of Lola, about a 20-minute canoe ride from Munda and situated in the VonaVona Lagoon. This lodge has been hit by hard times, so don’t expect the royal treatment; however, the island is peaceful and offers scuba and fishing trips, as well as cooked food and a nicely tended bar. One of the most striking features of the country is the large number of small villages, where over 75 percent of the population lives. I had the opportunity to live in the village of Baraulu, which is situated on a barrier island in the Roviana Lagoon, in the Western Province, about 30 miles from Munda. Like most villages, it’s predominantly subsistence-based (meaning, villagers catch all seafood and grow all crops), does not have electricity, the drinking water is collected from rain, and the water for washing is piped from the mainland via a submerged pipe that gets clogged with leaves washed down from the mainland bush every time it rains. Last year, the fresh water pipe burst, which meant four days of no water and a three-day effort by the men of the village to raise the pipe from along the lagoon bottom and find and repair the leak. It’s times like that, their lifestyle truly amazes me. The pipe is laid across the lagoon floor. The villagers must first find the broken section of the pipe, then pull it up to repair the leak. This is done entirely by manpower–no machines–diving, heaving, and maneuvering 50 or so paddle canoe boats and two engines boats in the blistering sun all for the luxury of having extra water to wash with. The villagers depend largely on seafood for their diet. Every household has at least one garden, most having three (one in Baraulu, one on the mainland, and one on the nearby island of Reregana), with every individual over the age of 18 having rights to a plot. The garden is very important for providing the staple crops (potato, cassava, taro, or yam), and while villagers are not overly concerned with food availability, most do feel that they have less food after the harvest of the potato (every three months). In addition to the potato, rice is another staple. The most commonly eaten vegetables are slippery cabbage and snake beans, and some villagers grow cucumbers and cherry tomatoes. Surprisingly, though, the most preferred meal is rice, canned tuna, and ramen noodles. (I would often trade canned tuna for freshly caught.) Several households own chickens, though they are not cooped so eggs are rare. And a couple of households own pigs, which are slaughtered on very special occasions. My favorite Solomon foods include any fish cooked bonboni (over hot rocks), riki or deo (the most important subsistence shellfish) cooked in coconut milk, and fire-cooked coconut crab (which actually eats coconuts and lives in palm trees). Only certain men have the talent to catch the coconut crab. First, they locate the crab by searching for tracks next to the bases of palm trees; then they entice it out of the branches, bribing it with pieces of coconut. Unlike Westerners, food is merely a necessity for Solomon Islanders. The attitude toward food is “If we have it, we’ll eat it.” Most households eat two to three meals a day, usually including a big breakfast and dinner. Most kitchens lack finished floors, and consist of a fire pit, a bench, and a small table. At night, the kitchens are extremely smoky and dark. As a visitor, I had the distinction of being invited to special feasts [such as, after Sunday church, for the blessing of a newly built house, or in honor of a child’s first birthday (because of the high infant mortality rate, the first birthday is traditionally the only one celebrated)], during which time I have been asked to sit among the elders of the village. Exactly what this means depends upon the setting, but in general special guests are offered seats, while others sit on the floor; or they will sit in the main part of the house, while others sit outside. Also, those being honored are typically served before everyone else by women and girls from the village. These celebratory meals are elaborate, and massive amounts of food are prepared. Such meals might consist of potatoes, rice, noodles, corned beef, tinned tuna, stewed chicken, barbequed fish, and sometimes barbequed pork, with doughnuts for dessert (not a “heart smart” menu, to be sure). At the end of the meal, the elders and guests speak some words of appreciation and we ritually clap after each speech. Day in and day out, the village is full of laughter and chatting, chewing of betel nut and smoking tobacco, but it’s most romantic at night when there’s calm in the air, the stars shine bright, and there are no artificial lights to drown the detail of the night sky. The stars are amazing–the Southern Cross, in particular–as there are no bright cities for hundreds of miles. People visit each other, sit on porch stoops and in kitchens, and tell stories. Everyone has red teeth from the betel, and I am still amazed at how they can talk and talk for hours. One house in Baraulu owned a generator, with a TV and a VCR. Until last year, they’d show monthly dime-store action movies; then a family member took the VCR to Honiara, where he went to work… Now it’s back to story telling. During the recent civil unrest, many Solomoners moved back to the villages where they could live off the land. Baraulu, like all villages in the Solomon Islands, is caught between two fundamental economic states: a subsistence economy and a market economy. The villagers are not completely subsistence-based–they need money for kerosene, rice, school (tuition, uniforms, paper, and pencils), laundry soap, and more. Many households survive in Baraulu because of “remittances” (or payments) from relatives with wage labor in Honiara, Fiji, or Australia. I am most concerned about the next generation of Solomon Islanders because of their lack of education. Many argue that this is a Western ideal and that our formalized education has facilitated the breakdown of many traditional social institutions and a loss of community. I agree that children must be taught about their own environment in order to maintain the social legacy, but further avenues of education are important as the Solomon Islanders become more entrenched in the global economy. The children face many obstacles to achieving an adequate education. For instance, many of the teachers lack the proper learning, themselves, to teach others. (Prior to the recent instability, many schools had Peace Corp volunteers who have now gone elsewhere.) Also, the schools lack supplies: teachers are not given paper, chalk, or textbooks; homework is handed out on paper cards, which have been used for years and have the answers scribbled on them. The country charges a fee for tuition, but many households simply don’t have the money and so are not able to send their children beyond primary school. In addition, the secondary school system is composed of a number of understaffed boarding schools that will only admit a small group of students per year. Thus, the students must each take an entrance exam, which most are unlikely to pass. Beyond this, the government lacks the resources to pay teachers sufficiently and regularly, and the system of payment is odd as the teachers have to travel a great distance to pick up their paycheck in town every second Friday, which means the schools must close on that day so teachers can get paid, and sometimes their checks aren’t even there. But for all of the economic disorder in the Solomon Islands, there are forces that help institute order and organization. One of these is the church. At the turn of the twentieth century, missionaries arrived in droves at the Solomon Islands. In Roviana Lagoon, the charismatic leader Reverend J.F. Goldie rapidly built a Methodist congregation. The Seventh-Day Adventist Church soon followed, though their foothold grew stronger near the Marovo Lagoon. The late 1950s saw a breakaway movement from the Methodist Church and the formation of a third denomination–the fiercely independent, communally based, and highly syncretistic Christian Fellowship Church (CFC)–founded and led by the prophetic Silas Eto [known as the “Holy Mama” (mama, in New Georgian languages, is an affectionate term for “father”)]. The church formally broke with the Methodists in the 1960s, and now nearly 100 percent of the Roviana Lagoon belongs to the CFC religion. The church has become a powerful force in western Solomon’s economy and politics, and its leaders are involved in shrewd, profitable, and often legally suspect business ventures. In fact, every day starts with singing like this, but generally later and up at the school. The voices can always be heard like a blanket over the village. This distinctive “parade” occurs only on Sunday mornings, and Tuesday, Thursday, and Sunday evenings at dusk. The clapping, however, happens all the time–at the start and end of a journey (e.g., when one boards and disembarks a boat, which is as constant as getting in and out of a car in our society), before and after a meal, when the village bell rings, to introduce a visitor to an area, a hundred or so times during the four hours of Sunday church services, and so on. The sound of hands clapping becomes pervasive and over time it offers great comfort–like a companion, a constant in island life that leaves a harsh void in its absence. The structure of the CFC is interesting–almost ironic considering where I was and where I came from. During World War II, the Holy Mama was greatly impressed with the American army, which subsequently influenced the rituals of his religion. During a church service, the congregation marches, flags wave, and members salute one another. Also, the church insists that all villages are modeled after military bases, with one central public area, surrounded by village residences; and all the houses are built beside one another in an orderly fashion. When the Holy Mama died, he was succeeded by his son, known as the “Spiritual Authority.” The equivalent of the Holy Trinity, for followers of the CFC, is the Father, Son, the Holy Mama, and the Spiritual Authority. Situated around the village are “presence sensors” for the Spiritual Authority; these are rods or wires that are said to move when the Spiritual Authority is near, and while I was raised to believe such mysticism is a hoax, I have witnessed them in action: one day the Spiritual Authority came to visit my village (chewing on betel nut, his gold chains and Rolex drawing attention to his many business “conquests”) and the wire started waving like mad. I can offer no reasonable explanation for it. Still, as amusing or incredulous as many of the religious rituals and beliefs are, and as corrupt as the church might be in its business practices, the CFC does have a positive influence on the community–it brings structure, solidarity, and services to the villages, where the government alone cannot. For example, the villagers participate in church-sponsored community workdays once or twice a week, during which they repair the school house, clear community forest land, plant teak in the community forest, fix the water line, help build houses, and more. Plus, per CFC dictum, no one works on Sunday. The church is the center of community festivals and it prohibits drinking (Solomon Islanders typically love to drink, are bad drinkers, and will drink until all their money is gone). And these are just a few of the plusses of the CFC’s influence on Solomon communities. But for me, all of these positives are reinforced by one more thing: I would never interfere with the CFC religion, for I believe that constant sound of clapping represents a strong and vital community–unified, it keeps me safe during my journeys throughout this troubled jewel of the South Pacific.